This time, one with a message. The choice of character names is hilarious (Obi-wan Cannoli! ), and the voices are pretty much spot on. 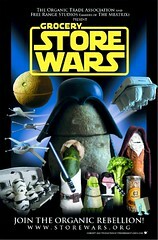 Love the stormtroopers, “more chemical than vegetable”, “reach out with your peelings”. And wait till you see their version of R2-D2. I nearly fell off my chair laughing. First saw it on the Treehugger site.